A Funcinpec official said Sun­day he opposed the idea, saying only parties elected to the Nation­al Assembly should be represented in the new upper house of parliament. A political analyst said the petition could be seen as a bid for the CPP to reward small parties for their support. Twenty-one parties—which together received less than 10 percent of the total vote in July—made their request to be represented in the Senate in a letter dated Nov 17 and delivered to the CPP-Funcinpec working group that is hammering out the details for the new upper house. 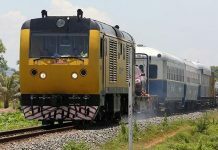 On Sunday, a signatory to the petition said the list of parties had expanded to 23 and a proposal would be sent to King Norodom Sihanouk. Funcinpec and the CPP agreed to create an upper house, or Sen­ate, less than two weeks ago at a summit chaired by the King. The agreement resolved the problem of there being only two top posts available for three key CPP and Funcinpec leaders. 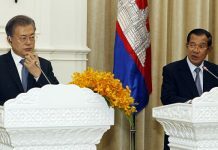 Under the summit agreement, Hun Sen becomes prime minister, Funcinpec leader Prince Nor­odom Ranariddh the president of the National Assembly and CPP President Chea Sim the head of the new Senate. The CPP-Funcinpec working group has been unable to agree so far on how, exactly, the new sen­ators should be chosen. Peter Schier, country representative of the Konrad Adenauer Foundation, a pro-democracy think tank, said he thinks the Se­nate is an unnecessary waste of money. He also is against making election losers senators. “It’s obvious that the Cam­bo­dian people during the election did not want them in [the National Assembly], so to include them and perhaps give them more power [than Assembly parliamentarians] is going against the will of the voters,” Schier said. Schier said the proposal, if accepted, would be “kind of a reward for CPP-aligned parties, a reward for some party leaders who split from Funcinpec and Sam Rainsy” after the factional fighting in July 1997. Oum Sarith, an adviser to Chea Sim, said Sunday that he believes the idea has some merit in terms of national reconciliation, but that the Senate won’t be big enough to include all parties. 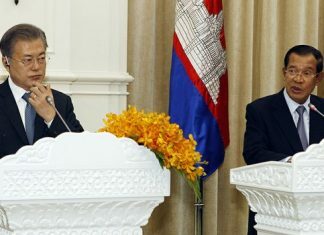 The prince and Hun Sen are scheduled to meet about the coalition this afternoon at the Council of Ministers. The prince played golf with Chea Sim on Saturday, party officials confirmed. The 23 parties that want to be represented in the Senate are: Buddhist Liberal Party, Cambodia Free Independent Democracy, Cambodian Farmers’ Development Party, Cambodia National Sustaining Party, Cambodia New Life Party, Cambodian Women’s Party, Free Development Republican Party, Free Republican Party, Khmer Angkor Party, Khmer Children’s Party, Khmer Citizen’s Party, Khmer Democratic Party, Khmer Farmer’s Party, Khmer Nationalist Party, Khmer Unity Party, Liberal Democratic Party, Liberal Republican Party, Molinaka, National Construction Party, National Salvation Liberal Democratic Party, National Solidarity Party, Neang Neak Neary Khmer Party, and New Kampuchea Party. The parties were listed before the election as being either aligned with the CPP or politically neutral.